IAM Midwest Territory General Vice President Phil Gruber, third from left, visits IAM Local 701 auto mechanics on strike at Napleton Cadillac in Libertyville, IL, along with IAM Midwest Territory and Local 701 staff. Gruber greeted the members with hot chocolate, lunch and 10-lb hams to take home to their families. 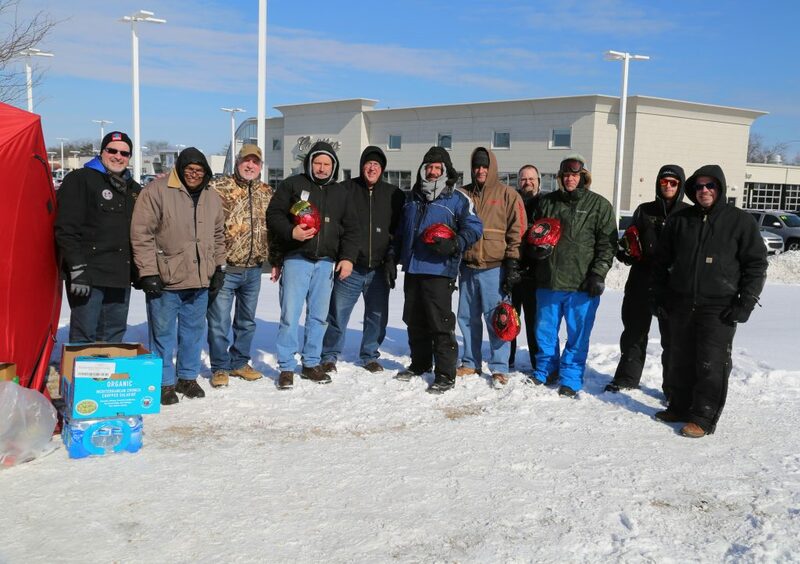 You make your union proud and we have your back, said IAM Midwest Territory General Vice President Phil Gruber during a recent visit with IAM Local 701 auto mechanics on strike in Libertyville, IL. The nine workers at Napleton Cadillac have been on strike since August 1, 2017. They joined the nearly 2,000 other Local 701 auto mechanics striking for better wages and a fair work schedule at 129 dealerships across the Chicagoland area. But, seven weeks later, when the dealerships met the union’s demands and the strike ended, most Local 701 members went back to work. Members at Napleton Cadillac, however, did not. They were still in a fight for their first contract. Their strike is now in its sixth month. GVP Gruber greeted members with hot chocolate, lunch and 10-lb hams to take home to their families. Local 701 Directing Business Representative Sam Cicinelli and his staff have been leading the the fight on behalf of the workers. Multiple unfair labor charges have been filed against Napleton Cadillac, including management’s attempts to intimidate the workers by sending threatening letters, rolling out the mechanics’ toolboxes and leaving one worker’s $100,000 worth of tools out in the rain to rust. Cicinelli and his team are awaiting the decision of an administrative law judge after a National Labor Relations Board (NLRB) hearing last month.